When you’re creating depth maps for a scene, you may encounter situations in which the range of depth intensities for the current frame is too small. But manually adjusting the levels for each corrupted frame is an extremely long and boring process. Moreover, some tools give you temporally unstable depth maps, and levels can change between consecutive frames. YUVsoft offers you a tool that performs automatic equalization of your depth map histograms: Depth Normalization. The Depth Normalization plugin for Adobe After Effects takes your depth video as input and returns to you an enhanced depth video sequence. Alternatively, you can adjust a single frame using YUVsoft Depth Normalization and then apply these changes to the entire scene using the YUVsoft Depth Propagation plugin. Depth Effects plugin for Adobe After Effects. 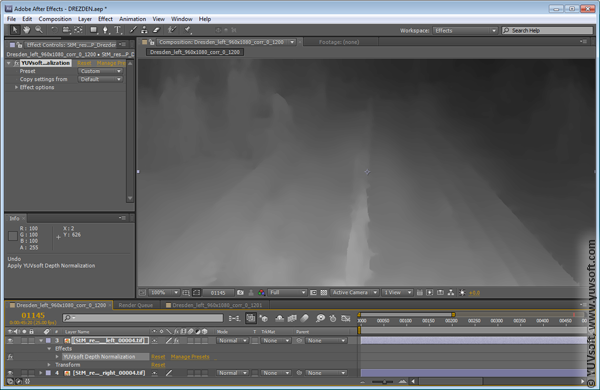 Depth from Motion plugin for Adobe After Efects – a good solution for obtaining key frames from scenes with camera motion.